Fulham’s pitch was “like a carpet” in Neil Redfearn’s eyes but on Saturday he and Leeds United head for a mudbath and a potential bloodbath on the west coast of Lancashire. Blackpool away is both a gift of a fixture and a monumental challenge; a visit to the worst team in the Championship and and outing on the worst surface in the division. Fulham’s grass has survived the winter and Leeds made the most of it on Wednesday night, winning 3-0 in west London and claiming a first victory at Craven Cottage for 30 years, but a different tack might be needed at a venue which coaches and players have criticised en masse. “Fulham’s like a carpet,” Redfearn said. “It’s a great pitch and to be fair to Fulham, they try to get the ball down and play. Leeds coped with a difficult surface at Wigan Athletic two weeks ago, grinding out a 1-0 win through a second-half goal from Alex Mowatt, and the state of the pitch at Bloomfield Road has been no help to Blackpool. Eleven clubs have won there already. 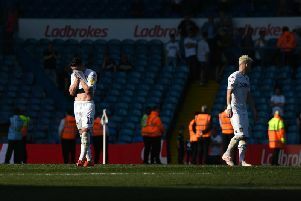 The Lancashire club – a Premier League side three-and-a-half years ago – are on the brink of relegation and will have their demotion to League One all but confirmed should they lose tomorrow and other results conspire against them. Even if Lee Clark’s squad hold on, they will drop out of the Championship soon enough. Their game against Charlton Athletic in midweek, ending in a 3-0 defeat, attracted the lowest crowd recorded at Bloomfield Road for 10 years. Reports in Lancashire say a mass boycott is planned tomorrow, with scores of Blackpool supporters planning to attend a non-league game between AFC Blackpool and Bootle. Blackpool’s manager, Lee Clark, has been sympathetic with the mood on the terraces. “It’s demoralising looking up at the empty seats,” he said, “but I don’t blame the fans. Blackpool have fielded 51 players in league fixtures this season alone. Leeds have used their share but the cast of thousands at Bloomfield Road is in contrast to the tight group who are serving Redfearn well in the second half of the term. United’s head coach made just one change at Fulham, replacing Steve Morison with Sam Byram, but his options could be greater this weekend. Rodolph Austin, who has not been available since a 3-2 defeat to Watford last month, has all but recovered from a thigh strain and might be suited to a combative environment at Blackpool. Granddi Ngoyi is recovering from a similar injury but he proved his fitness by completing 88 minutes in a development squad game at Crystal Palace on Tuesday. Ngoyi is also a strong, physical midfielder and a player who is catching Redfearn’s eye in training. Few others have had much chance to analyse the Frenchman. His injury – an aggravation of an old and underlying problem – occurred a few days after he joined Leeds on loan from Palermo. Redfearn said: “He’s got a chance and we’ll see how he is.